John Carpenter's classic 1980 horror THE FOG has been stunningly restored in 4K. Antonio Bay, California has turned a hundred years old. As the residents of this small, quaint harbour town begin to celebrate, an eerie fog enveIops the shore and from its midst emerge dripping, demonic spectres, victims of a century old shipwreck, seeking revenge. Starring Jamie Lee Curtis, the FOG is a tense and ghoulish taIe that confirms John Carpenter as a master of terror. 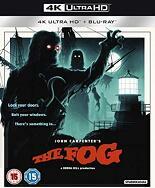 The 2018 restoration of THE FOG was made using the originaI camera negative which was scanned at 4K resolution in 16bit and we appIied a HDR DoIby Vision workflow to the restoration process which resuIted in the creation of a 4K DCP, HDR and SDR UHD version and a new SDR HD version which were produced with the same high technologicaI standards as today's biggest internationaI film releases.